First reviews of the new European satellite navigation system Galileo suggested in 2014 that Galileo can significantly improve the positioning accuracy. Particularly in street canyons as pictured in the photo above, that should be noticeable with normal smartphones, too. We wanted to explore this matter in more depth and carried out a realistic comparison test. As part of our project with the ESA Business Incubation Centre (Darmstadt), we tested the accuracy of smartphone satellite positioning with and without Galileo. 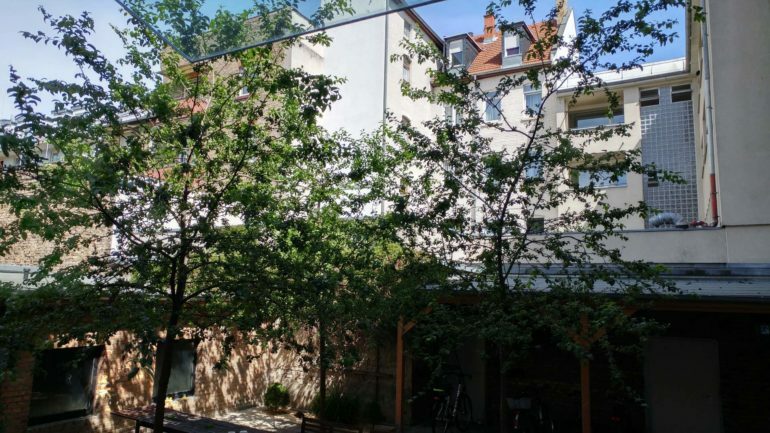 We compared the accuracy in a typical urban setting in two test scenarios: Our 4-floor office in Mannheim is an old building in a dense environment. It has a backyard surrounded by buildings. Our first test setting was the street around this building; a second test was performed in the backyard of the building. Scenario 1: We walked on the streets around the building close to the walls and ended the walk entering the building through the main entrance (tracking time: 2 minutes). Scenario 2: We sat in the backyard for 1 minute and then walked one round through the backyard for 1 minutes. In both scenarios, we tracked the footpaths using the app stated above and carrying the smartphones in our hands. 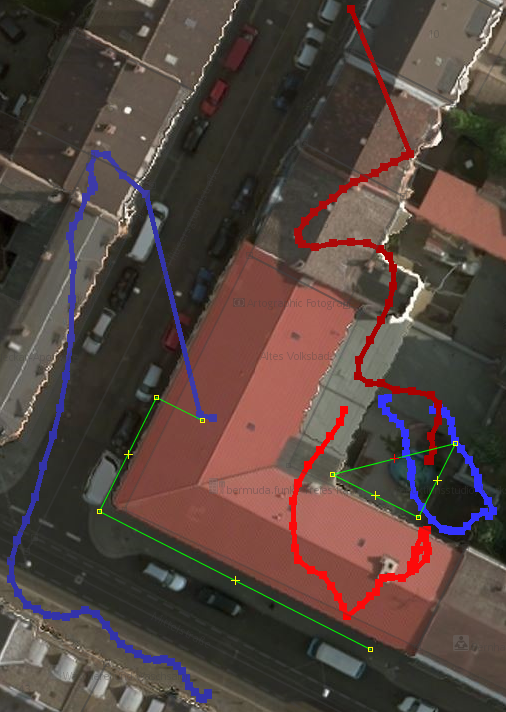 Afterwards, we visualized and analyzed the paths with JOSM (actual footpaths vs. smartphone positioning). You can already see in this picture that the positioning with the Galileo-capable smartphone was much more accurate and closer to the actual footpaths. On basis the captured data we then measured the deviations in meters between the actual position and the calculated positions using the timestamps of the measurements for the first scenario. The result: In our small-scale test in an urban environment, the Galileo-capable smartphone performed ca. 50% better than the non-Galileo smartphone. 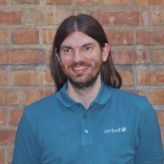 On average, the deviation of the Galileo-capable phone was 14.4 m, while the deviation of the non-Galileo phone was 27.5 m. This gain of positioning accuracy is really exciting for us – because our contagt-app now also supports Galileo!